Cutting cables in droves seems to be very popular nowadays and a lot of companies are putting out their online streaming options to compete. Marathon watching TV is the new most popular leisure activity with more and more video streaming services emerging on the market each year. In the beginning of the cord cutting era the choice was simple – Netflix. Today, there are different kinds of both devices and streaming services appealing to different audiences depending on their background – cord-cutters, cord- shavers or even new crop of cord-nevers. Since it’s not always easy to decide what streaming service suits you best, we’ve compiled a list of top 10 in a random fashion, to help you with your decision making and narrow down your search. Benefits: HBO Now is ideal for people who are not really fans of cable TV. Join to get the greater part of the TV offer, films, specials, and documentaries. In the event that you already have HBO through your cable provider, have in mind that the HBO Go application gives you a chance to watch HBO on your mobile, tablet, and many other devices. 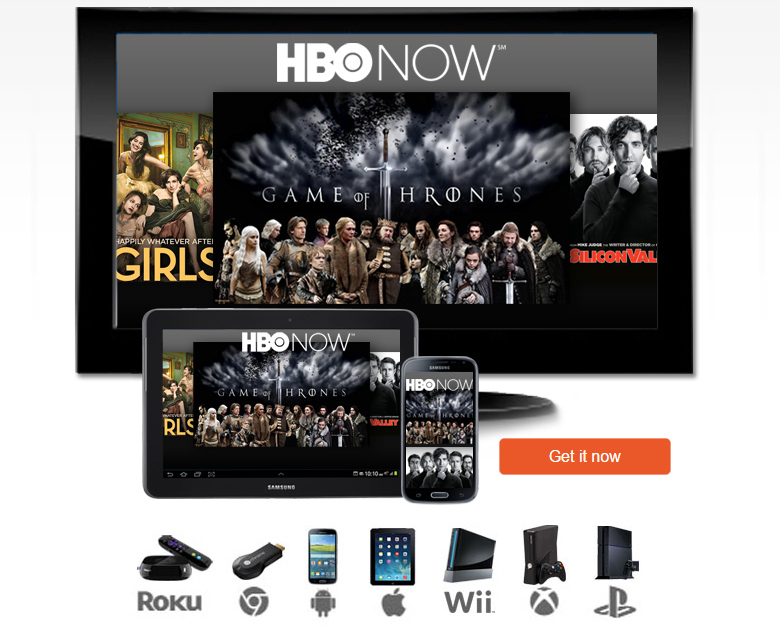 Useful information: HBO Now has more than 5 million subscribers and it’s now available on different devices, including Amazon Fire TV, Apple TV, Chromecast, Microsoft Xbox, Roku, Samsung TVs, and PlayStation Vue. It’s also available via a growing number of cord-cutting streaming services, like DirecTV Now, or as part of Amazon Channels. Point being if you ever wanted HBO content but didn’t want to pay for cable or satellite service, HBO Now is your best option. Even better, if you’re an Apple tech user, HBO Now works with its own app on your Apple TV, iPad, iPhone, and through a web browser on your Mac(or any other PC. Benefits: Best solution for cord-cutters looking for another option in addition to Sling TV and DirecTV Now. It has cloud DVR with unlimited storage offering live TV from 50 providers. With its selection of channels, like Bravo, Disney, ESPN, FX, Fox News, Fox Sports, MSNBC, National Geographic, USA and many more. There is also an option to add channels like Showtime for additional fee. YouTube says it’s still in discussions with networks, so more channels could be added soon. Useful information: recently it was announced by Google that the price of YouTube TV will move from $35 to $40 per month, because MLB Network would be included soon and the plan is for YouTube TV to also carry MLB for an additional fee which remains to be disclosed. YouTube TV offers rich program on all devices with plot descriptions, cast information, and related programming for movies and shows. For sports, team information, league rankings, scores, and roster details are all available. Benefits: Netflix has a vast library of movies and TV shows, plus now-classic original shows like “Orange Is the New Black” or hits like “Stranger Things”. It even has original movies “Beasts of No Nation”. A contract with Marvel brought “Daredevil” and “Jessica Jones” to Netflix and subscribers will have access to Disney titles until the end of 2018. After that Disney will remove those so start its own streaming service. Useful information: Netflix is co-financing and distributing Michael Bay’s next film, “Six Underground,” with Ryan Reynolds. The movie is expected to appear on Netflix in 2019. Also, Netflix has expanded its relationship with Comcast, which will include a Netflix subscription to new Xfinity cable packages. Benefits: Again, ideal for cord-cutters. Sling TV offers channels rather than individual shows. The basic Orange package comes with about 30 cable offerings, including A&E, the Food Network, and TBS, but limited broadcast TV. In some markets Fox and NBC are available and Univision is part of the Blue package. Orange and Orange-and-Blue plans as part of the $5-per-month Broadcast Extra add-on pack. Of course adding premium channels is possible, for example HBO or Showtime. That accounts for an extra $10 to $15 per month. Useful information: Since launching of the NBA League Pass a $29-per-month add-on is possible which lets fans enjoy out-of-market games. Additional NBA Team Pass is possible a separate plan that lets you get out-of-market games for a single NBA team. This costs $18 per month on top of a Sling Orange, Sling Blue, and/or Spanish-language services plan. Benefits: With a $99 year subscription you can access Amazon original services with thousands of popular shows from around the world. You can even get a free Kindle book every month and free two-day shipping on the purchase. Amazon features over 40,000 titles of live streaming, but only small number of those can be found in the Prime streaming. It also allows offline downloads, so if you want to catch up on some old shows when you have extra free time, you can simply download it to your tablet and start watching. If this isn’t the case you can also enjoy other programs like Transparent, Alpha House, and Mozart in the Jungle. Recently, they have added a selection of comedy and other children programs resulting from a deal with Viacom which controls MTV, Comedy Control, and Nickelodeon. Useful information: Amazon Prime Video is available in many countries besides the US: Canada, Australia, Mexico, the UK, France, Italy, Spain etc. You can enjoy watching it on a number of supported devices such as Apple TV, Android, Smart TVs, Kodi, Roku, Fire TV Stick, Xbox, and PS4. Price: $119 per year or $13 per month; A video-only subscription costs $9 per month. Benefits: If you are in love with British TV then Acorn TV is the ideal choice for you. Browsing the content library on Acorn TV, you’ll come across current TV shows, feature films, documentaries and exclusive content. Every Monday new episodes of current shows are added in the database. You can browse through the archive and find past seasons of viewer favorites like Poldark, Doc Martin, and Midsomer Murders. Useful information: With an internet connection and a supported device, you can watch some of the most popular British programs and Acorn exclusives the classic ’80s comedy series “Alfresco,” which kick-started the careers of actors and actresses like Hugh Laurie, Emma Thompson, and Stephen Fry. You can access Acorn TV on the following devices: laptops, desktops, and tablets with browsers, iphone, android devices, Roku, Amazon Fire TV, Fire TV Stick, Apple TV. It is available in the U.S. and Canada as well. Recently Acorn TV became available on Comcast’s Xfinity X1 cable box, accessible via Xfinity on Demand and on the go via the Xfinity Stream app. Price: $4.99 per month, $49.99 per year. Benefits: CBS All Access is featuring CBS-only shows both live and on demand. Suitable for cord-cutters who are looking for major-network fare.The service provides full-length episodes of CBS programs, and live programming streams of local CBS affiliates in total of 124 markets. CBS All Access has complete back catalogs of most of its current popular series. Useful information: Roughly speaking according to CBS there are now 2.5 million subscribers to CBS All Access. You can also watch CBS original shows like The Good Fight, The Good Wife, and The Big Bang on demand. There is also possibility to get access to shows that air exclusively on CBS All Access, like for example, Star Trek: Discovery. Sport lovers can enjoy NFL matches including including Thursday Night Football with the All Access app. The fun part is that all Amazon Prime members can get the ad-free CBS All Access package with their Amazon Prime membership. Price: $9.99 a month for an ad-free subscription; $5.99 a month for a limited commercials subscription. Benefits: Anyone who wants over the top services but not a satellite dish. DirecTV Now is limited to two simultaneous users at a time. You can watch DirecTV Now on a lot of devices that have an Internet connection and can stream video. Many smart TV sets now have that capability but if you have an older television, you can use a streaming attachment – Roku, Amazon Fire TV Google Chromecast – to give it internet capabilities. Useful information: The company has now included a guaranteed cloud DVR, which is incorporated into the cost. The free version offers the option to record up to 20 hours of video for 30 days. In the event that that is insufficient, you can pay an additional $10 every month to increase storage to 100 hours, and keep recordings for 90 days. Another new deal: paying additional $5 a month to get a third synchronous user. Useful information: Hulu recently signed a deal with DreamWorks Animation for the exclusive streaming rights to upcoming DWA feature films, as well as titles such as “Shrek,” “Shrek 2,” and “Shark Tale”. From 2019, the service will also get new theatrical releases, including “How to Train Your Dragon: The Hidden World” and “Trolls 2.” Hulu has also signed a deal with Sony for the on-demand streaming rights to “The Good Doctor.” A third season of “The Handmaid’s Tale” is secured as well. It is available on any Android or iOS device. The experience on smartphones and tablets is amazing, with smooth playback and sharp resolution. Price: $8 per month with ads; $12 per month without ads. Benefits: Perfect for Showtime series fans. Very similar to HBO Now, Showtime allows you to watch a cable network without the cable. You have access to all of Showtime’s movies, plus original shows such as “Billions,” “Homeland,” and “The Affair.” Showtime offers streaming Hollywood movies plus its own original content. Showtime’s original series include “Homeland”, “Ray Donovan”, and “The Affair”, plus proven hits like Dexter. Useful information: Showtime aired the 18-part of David Lynch’s masterpiece “Twin Peaks” in 2017. Also “Purity,” a 20-episode drama starring Daniel Craig debuts in 2018. In addition to their original fictional series, NHL fans can enjoy the Showtime’s All Access: Quest for the Stanley Cup series.Alongside all of this on-demand content, Showtime allows subscribers to stream the channel live. You can choose between Showtime East and Showtime West. Price: $11 per month; $9 per month when purchased through certain services (Amazon Prime and Hulu). To sum up, more and more consumers cut their cords and video streaming services are becoming the dominant form of entertainment easy to monetize. One of the ways to do is to put your content behind a paywall. This is a major business decision and as such, it requires careful consideration. Our paywall solution is flexible, making the experience the best possible for your users. Get in touch for more details!